Whether you're looking for a solution to messy salad dressing containers or inefficient liquor pourers, this 1 qt. pour bottle with orange spout and cap will meet your needs! The white 1 qt. container is made of acrylonitrile styrene with straight walls that won't harbor bacteria, and a ridge that accepts the cap while not in use so it doesn't get lost. The neck gives your employees a secure grip as they pour drinks for customers and is detachable so it's easy to clean at the end of the night. The included orange spout keeps bugs out and promotes fast, controlled pouring. When it's time to store product, simply remove the cap from the bottom of the container, screw it on in place of the detachable neck, and place it in the refrigerator! This Store and Pour Bottle with a Orange Cap and Spout is a item that we use constantly in our bar. The color spout and cap are a great help to identify what is store in it. It is made out good material. It is price right. We recommend it. We decided to purchase some color-coated bottles for our tasting room to be more organized behind the bar. Once our new business attracted bigger crowds, it got easier to accidentally grab the wrong juice. These work great. I love these pour bottle. They are made really well and super easy to clean. I use it for storing different juices behind the bar and it works well. Would definitely recommend this item. The 1 Qt. 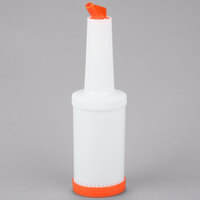 Pour Bottle with Orange Spout and Cap is well made and durable. It is great for color coding and it is easy to clean. It is perfect for storing homemade sauces and dressings. Use color coding in your bar or restaurant to increase efficiency and decrease customer wait time. These pour bottles feature an orange spout and cap. The bottles are made of a break resistant material and perfect for heavy use. I bought these and the spout was just too wide to use for what I was planning for. Overall they are pretty good pouring bottles. These speed n pour are great when you have busy bar during the weekends, and you have to deliver service quickly. I love how they come in many colors for color coding. We use this orange bottle to hold our orange extract to make it much easier to pour in to our frosting as needed. Then it is less likely to spill because of the cap we put on when we are done. These are super priced and look very professional!! The different color caps and screw on lids make it easy for quick drink making and storage of juice products!! Purchased a bunch of these to use during a July 4th Holiday work party because we had a snow cone machine and these worked great! The spouts pour without leak and spills while the caps are great for storing left overs. This was a very unique and easy to use product that i purchased fir my outside bar. I had every flavor to match every color. Great Pour to have in my bar, an like the orange color to have so i know what things are. Came to me with no problems an will be sure to order more again. Great bottle at a great price, these are very durable bottles and the price allows us to get a bunch extra. Will definitely continue to purchase these bottles!!! The product is great! And, once we figured out that the bottom colored portion twisted off and worked as a lid so that the spout could be cleaned daily that really helped. Prior we were having problems with mold growing in the spouts, so remove and clean them daily! We've since stopped using them simply because we don't serve many fruit drinks to our clientele and it was impossible for us to go through that amount of juice without it going bad. However, for a higher turnover establishment or a place that specializes in juice combo-drinks, these are really a great buy, conveniently colored and easy to store without the spouts. Although they are not Carlise they do well. They are cheaper than the original and there are some differences. but for what I need them for they do the Job. We use these for any of our juice. You can color coat everythoing in the bar so it makes a crazy night go a lot smoother.